March is the month for hosting it seems! 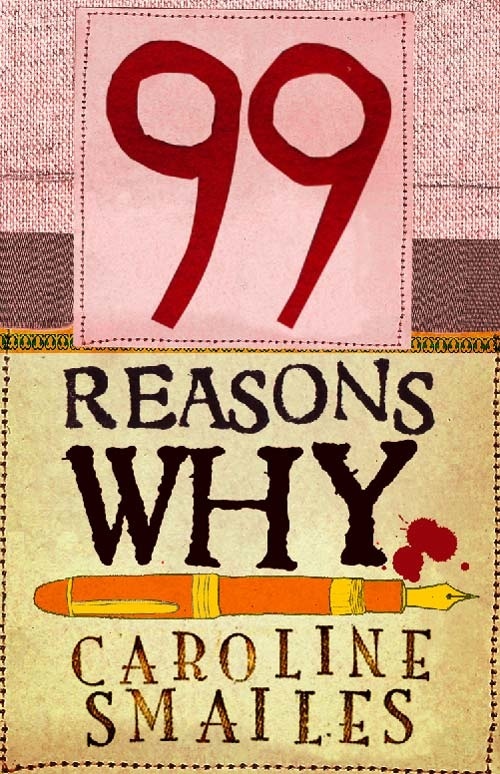 There will be a Q&A with Vanessa Gebbie next Friday, and this week I’d like to introduce you to 99 Reasons Why by Caroline Smailes. 99 Reasons Why is a book with a difference, and it’s catching a lot of attention. It is only being published as an ebook and comes with 9 different endings which readers can navigate using multiple choice questions on your Kindle or via a spinning story wheel on your iPad or iPhone – ideal for those of you who started using the new iPad since the 16th! There are also two additional endings. One is the ending that will be handwritten by Caroline and auctioned for charity, and the other is here for your reading pleasure today! If you haven’t already read 99 Reasons Why you can find it either for your Kindle on Amazon, or your iPad / iPhone on iTunes. And if you haven’t yet, but you have an urge to start at one of the possible endings…read on! With the extra day in February and an attempt to ensure I blog at least once a month, I’m taking the opportunity to add to the discussion on the future of publishing and of the book. This is a really exciting time of exploration, experimentation and connection, with thousands of voices interacting with this subject. With so many opinions out there and an insane research interest in this quickly evolving subject, I’ve found that I have my feet on either side of the digital vs traditional argument and I’m sure I’m not the only one. Although there are lots of articles out in the internet ether, the stance often plays devil’s advocate by introducing the proposition that the life of the traditionally printed book is at an end. Of course, a lot of media sources are going to speak in absolutes to provoke debate, however some do focus on the positives on the evolution of the e-book. I found the article “Are books and the internet about to merge?” by Damien Walter to be very interesting in the way he brings new light to the argument by focusing on the technological links between books and the internet as the electronic format is growing and the new way of defining books. “E-Books Can’t Burn” by Tim Parks also had an intriguing position, by exploring the nuances of the book experience. However, it was the comments on both of these articles that interested me the most. With an engaged audience comes intelligent and at times protective response which opens the debate to much wider subjects such as copyright, generational gaps, the position of publishers and agents, the importance of storytelling, and books as objects. For me, with my feet planted either side of the debate, what I’m most excited about is what is going beyond traditional AND e-books. The experiments into multimedia storytelling like the next digital project from Kate Pullinger, “Dual”, show us how literature is beginning to move beyond the constraints of traditional novels. On the other side, handmade original printed editions direct from authors and “desirable and collectable” editions from literary publishers are popping into the publishing news and circles, and both enthral me. For example, the new imprint at Bloomsbury, Bloomsbury Circus, will be shamelessly literary in unusually sized printed form, whilst Picador celebrates their 40th anniversary this year with beautiful black and white editions of classics new and old with additional resources and material for readers to explore the texts further. I realise that the debate on traditional vs digital will rage on for some time, and whilst it does I’d love to hear what you think is the future of publishing and how are you engaging with the future possibilities for either and or both formats. Please leave a reply below! *with thanks to Chris, a.k.a “nattybumpo” commenting on “Are books and the internet about to merge?“, for the inspiration. And to 47giraffes for post photograph!